Corn is a plant that evolved in Mexico, and was unknown in Europe until after Columbus crossed the Atlantic Ocean. 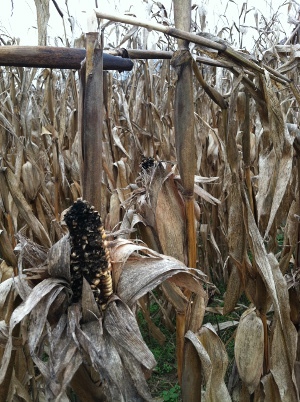 When the English settlers arrived in 1607, corn was a key food crop of the Native Americans in Virginia. 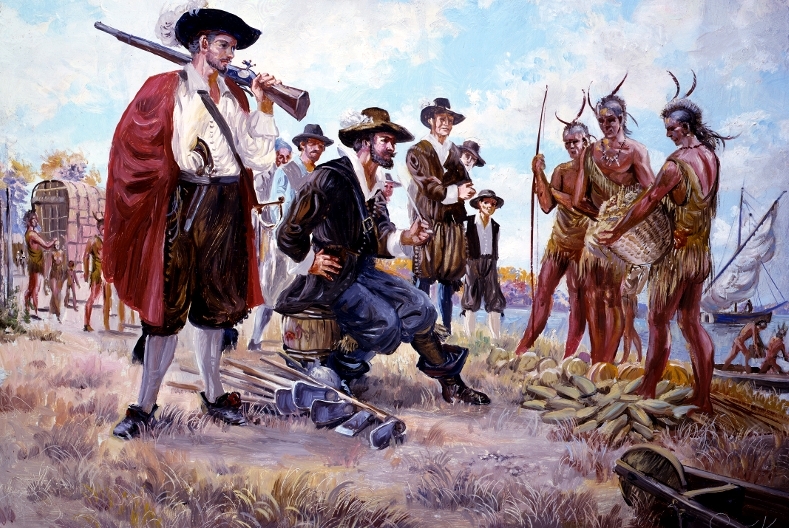 The English colonists planned to trade for food (as did the Spanish in Florida). From the beginning, the colonists were planning to eat corn grown by the Native Americans in Virginia. The Virginia natives may have domesticated squash, sunflower, sumpweed, and goosefoot, converting wild species into crops that could be farmed regularly - but corn was imported, not domesticated in Virginia. Native Americans in Virginia, including the Chickahominy tribe ("coarse ground corn people") relied upon a food source that was domesticated originally in Mexico close to 18° of latitude. The greatest labour they take, is in planting their corne, for the Country naturally is overgrowne with wood. To prepare the ground they bruise the barke of the trees neare the root, then doe they scortch the roots with fire that they grow no more. The next yeare with a crooked peece of wood they beat vp the weeds by the rootes, and in that mould they plant their Corne. Their manner is this. They make a hole in the earth with a sticke, and into it they put foure graines of wheate and two of beanes These holes they make foure foote one from another; Their women and children do continually keepe it with weeding, and when it is growne middle high, they hill it about like a hop-yard. In Aprill they begin to plant, but their chiefe plantation is in May, and so they continue till the midst of Iune. What they plant in Aprill they reape in August, for May in September, for Iune in October; Every stalke of their corne commonly beareth two eares, some three, seldome any foure, many but one, and some none. Every eare ordinarily hath betwixt 200 and 500 graines. The stalke being greene hath a sweet iuice in it, somewhat like a sugar Cane, which is the cause that when they gather their corne greene, they sucke the stalkes: for as we gather greene pease, so doe they their corne being greene, which excelleth their old. They plant also pease they call Assentamens, which are the same they call in Italy, Fagioli. Their Beanes are the same the Turkes call Garnanses, but these they much esteeme for dainties. Their corne they rost in the eare greene, and bruising it in a morter of wood with a Polt, lap it in rowles in the leaues of their corne, and so boyle it for a daintie. They also reserue that corne late planted that will not ripe, by roasting it in hot ashes, the heat thereof drying it. In winter they esteeme it being boyled with beanes for a rare dish, they call Pansarowmena. Their old wheat they first steepe a night in hot water, in the morning pounding it in a morter. They vse a small basket for their Temmes, then pound againe the great, and so separating by dashing their hand in the basket, receiue the flower in a platter made of wood, scraped to that forme with burning and shels. Tempering this flower with water, they make it either in cakes, covering them with ashes till they be baked, and then washing them in faire water, they drie presently with their owne heat: or else boyle them in water, eating the broth with the bread which they call Ponap. The groutes and peeces of the cornes remaining, by fanning in a Platter or in the wind, away, the branne they boyle 3 or 4 houres with water, which is an ordinary food they call Vstatahamen. But some more thriftie then cleanly, doe burne the core of the eare to powder, which they call Pungnough, mingling that in their meale, but it never tasted well in bread, nor broth. Corn grown by the Native Americans in Virginia was a major food source for the English colonists, as well as the Native Americans. Powhatan controlled access to food as a key part of his foreign policy with the English. To bypass his control, the English extended their explorations beyond his territory, starting with John Smith's explorations of the Chesapeake Bay and Potomac River in 1608. In 1613, Pocahontas was captured by Captain Samuel Argall as he negotiated for food supplies with the Potowomack tribe at the mouth of Aquia Creek. Of course, the English also used food as a weapon in the Anglo-Powhatan wars. They seized mature corn and destroyed immature crops in Native American towns, denying food to their enemies. 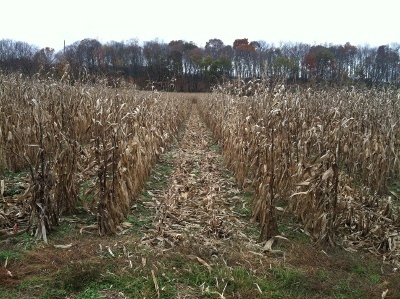 As the English settled Tidewater, then the Piedmont and west of the Blue Ridge, they planted more fields of corn. To convert the kernels into corn meal, the colonists built grist mills with stone wheels that ground the grain. Most Virginia mills were powered by water in local streams. Corn was ground for local consumption, while wheat was exported to the Caribbean, Europe, and other markets. 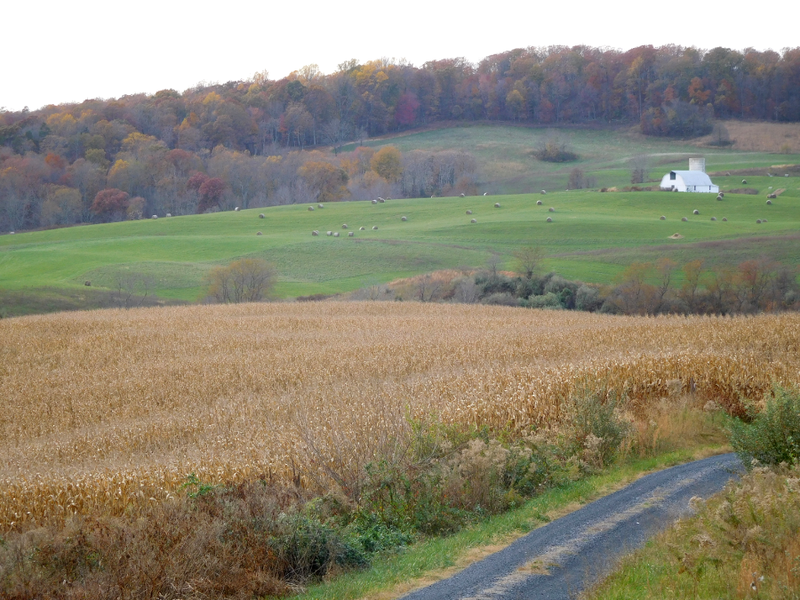 Today, corn in Virginia is grown for livestock as well as human consumption. 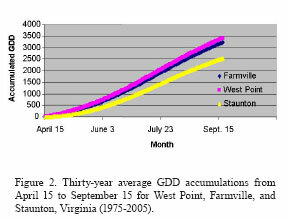 Potential impacts on the Chesapeake Bay are major concerns with raising more corn for fuel. Corn requires fertilizer, and runoff from agriculture is a major source of the excess nutrients that are damaging the bay. 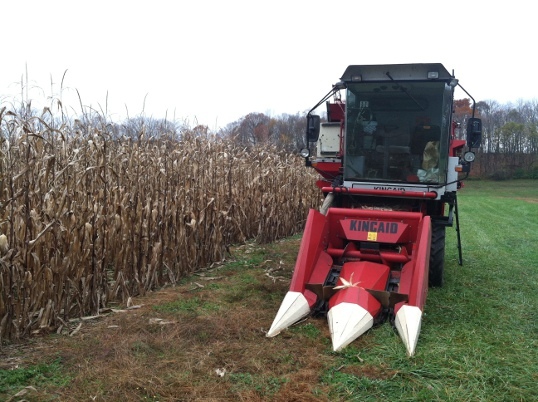 Modern corn varieties include genetically-modified varieties with resistance to disease and insects. 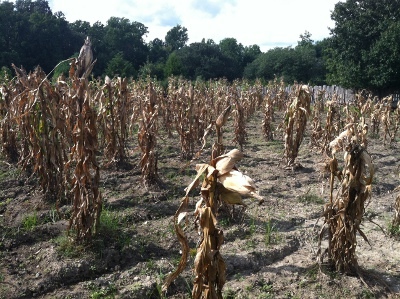 Most corn in Virginia is grown without irrigation, and water stress during droughts can affect yields substantially. Corn plants typically produce 15 leaves and one ear. Emergence is categorized as VE stage, first ear is V1 stage, and 15th ear is V15 stage. Length of the ear is determined primarily in the V7-V12 stages, and length of the stalk is most sensitive to environmental conditions during V9 and V10 growth stages. Fig. 24.— "Over two-thirds of the corn acreage of the world is in the United States, nearly all east of the line of 8 inches mean summer rainfall and south of the line of 66° mean summer temperature. Nearly 90 per cent of the acreage of corn for grain in the United States is in the Corn Belt, the Corn and Winter Wheat Region, and the Cotton Belt. In these three regions corn constitutes about one-third of the acreage of all crops. 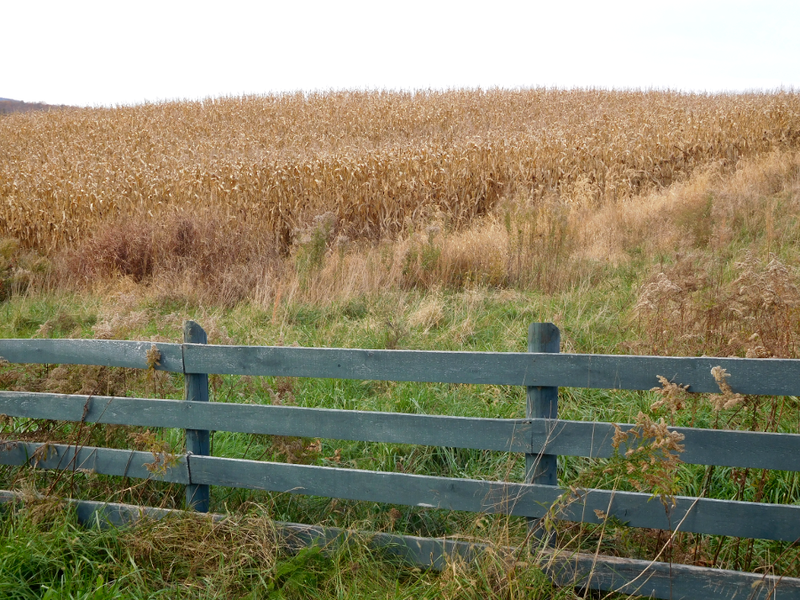 In the Corn Belt it is dominant, contributing nearly two-fifths of the acreage and half of the value of all crops. Hay, associated with spring oats in the northern portion and with winter wheat in the southern portion, are the other important crops in the Corn Belt."